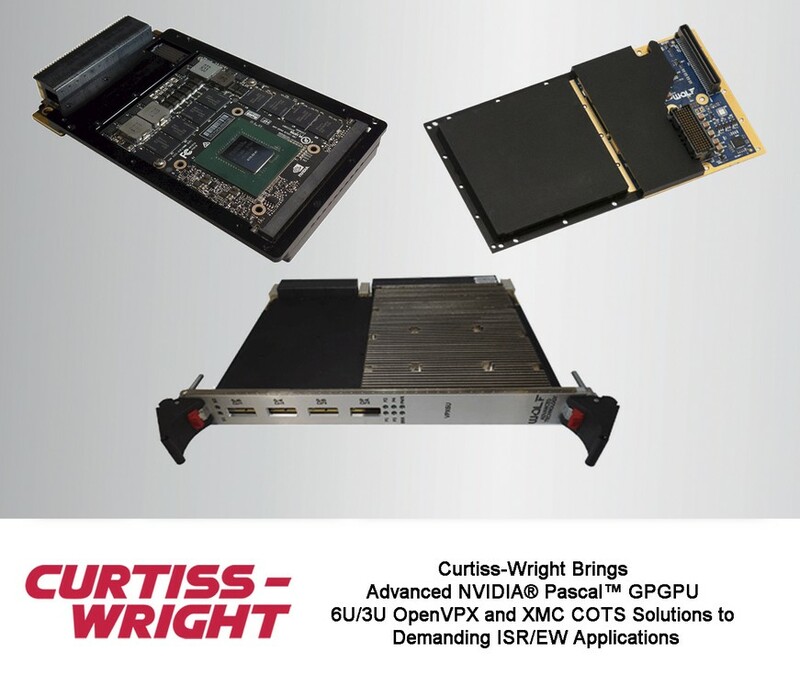 ASHBURN, Va. – February 15, 2018 -- Curtiss-Wright’s Defense Solutions division today announced the addition of three NVIDIA Pascal GPGPU modules to its comprehensive family of advanced performance boards and integrated systems for compute-intensive high performance embedded computing (HPEC) applications such as Electronics Warfare (EW), SIGINT, and Radar. The 3U VPX3-4923 (NVIDIA Quadro Pascal P5000) and 6U VPX6-4943 (Dual NVIDIA Quadro Pascal P5000) OpenVPX processor cards and the XMC-4902 (NVIDIA Quadro Pascal GP107) XMC processor mezzanine module provide system integrators with powerful options to speed and ease the deployment of CUDA® and OpenCL™-based solutions into rugged C4ISR systems. Use of these pre-validated and pre-integrated GPGPU modules greatly reduces the program risk associated with developing complex HPEC systems. Time to deployment is also significantly reduced since system integrators have faster access to COTS modules, development platforms, and fully integrated HPEC systems, all supported by Curtiss-Wright’s OpenHPEC™ Accelerator Suite™ of software tools to expedite development-to-deployment. Because they are able to ingest massive amounts of data from modern Radar, SIGINT, EO/IR sensors, these modules are ideal for ISR and EW applications that require TFLOPS of accelerated processing. With the addition of these NVIDIA Pascal GPGPU modules, Curtiss-Wright now offers system designers open architecture modules based on the latest, most advanced heterogeneous building blocks for HPEC systems: Xilinx® Ultrascale+™ FPGAs, Intel™ Xeon™ D multi-core General Purpose Processors and NVIDIA Pascal GPGPUs. The combination of three architectures enables whole new capabilities and performance in SWaP-constrained warfighter payloads that would have been unachievable just a couple of years ago. - VPX3-4923: 3U OpenVPX GPGPU Processor Card with NVIDIA Quadro Pascal P5000, 6.2 TFLOP. The VPX3-4923 provides four DisplayPort™ 1.4 outputs. Memory support includes 16 GB GDDR5 memory with NVIDIA GPUDirect™ DMA technology. - VPX6-4943: 6U OpenVPX GPGPU Processor Card with Dual NVIDIA Quadro Pascal P5000, 12.4 TFLOPS. The VPX6-4943 provides 8 independent DisplayPort 1.4 video outputs. Memory support includes 32 GB GDDR5 memory with NVIDIA GPUDirect DMA technology. - XMC-4902: XMC (VITA 42) module GPGPU Processor Card with NVIDIA Quadro Pascal GP107, 2.3 TFLOPS. For less demanding applications, the XMC-4902, features a lower power Quadro Pascal GP107 GPU. It provides four DisplayPort 1.4 video outputs. Memory support includes 4 GB GDDR5 memory with NVIDIA GPUDirect DMA. ISR and EW system designers using the CUDA and OpenCL programming languages are able to develop new SWaP-optimized heterogeneous computing HPEC applications. When integrated into Curtiss-Wright HPEC systems, these GPGPU processor cards provide the extreme levels of raw compute power required to address the massive amounts of data generated by modern ISR/EW sensors. The VPX3-4923, VPX6-4943 and XMC-4902 modules are fully interoperable with Curtiss-Wright’s broad family of system-level C4ISR/EW OpenVPX solutions such as the CHAMP XD1 Xeon-D processor 3U DSP module, the CHAMP XD2 - the industry’s only dual Xeon-D processor 6U DSP module - and the recently introduced VPX3 534/535 FPGA 3U modules. Curtiss-Wright HPEC modules and systems are supported by the OpenHPEC Accelerator Suite of best-in-class software development tools. OpenHPEC Accelerator Suite eases, speeds and lowers the cost of ISR application development. Using non-proprietary open standard based software, these tools bring the benefits of open standard HPC software to the COTS market to effectively remove the risk from developing large scale embedded computer clusters. The tools includes a broad and comprehensive array of open standard drivers, middleware and libraries. OpenHPEC Accelerator Suite also includes proven solutions for cluster-wide debugging tools, performance profiling, performance reports, data flow performance analysis, and built-in-test tools, all of which have already been developed and qualified for commercial HPC use. Curtiss-Wright’s OpenVPX HPEC modules are designed to support VITA 48.8 Air Flow Through cooling (AFT). For today’s COTS 3U and 6U VPX modules that dissipate ~150W+, VITA 48.8 provides a low-cost, effective means to cool the latest generation of high power components. Curtiss-Wright’s groundbreaking AFT cooled system-level solutions for compute intensive C4ISR/EW applications deliver optimal performance for today’s leading-edge semiconductor devices deployed in SWaP-optimized rugged chassis, and includes single board computers, FPGA modules, GPGPUs, and Ethernet switches. The VITA 48.8 standard (ANSI ratified Standard ANSI/VITA 48.8-2017, “Mechanical Standard for Electronic VPX Plug-in Modules Using Air Flow Through Cooling”) significantly reduces system size, weight, power and cost while increasing the reliability of avionics systems. It provides OEM suppliers with a license-free industry standard for cooling the latest high performance electronics used in demanding aerospace and defense applications. The VITA 48.8 Working Group was chaired by Curtiss-Wright. ANSI/VITA 48.8 compliant plug-in modules will provide government and industry customers. For more information about VITA 48.8 compliant modules, please contact the factory.